I am not a missionary, but I am not doing this just to make a profit. 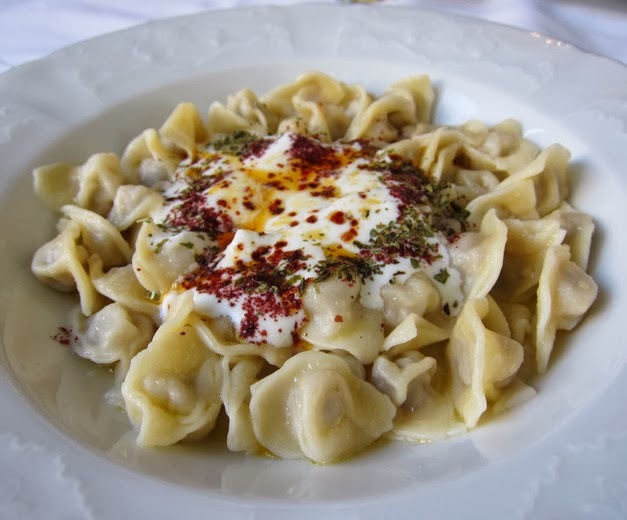 People must see that there is manti outside of Kayseri, there’s Crimean Tatar manti, as well,” explained Gülben Resuloğlu, in front of her restaurant in the leafy Feneryolu district of Istanbul’s Asian Side. If Martha Stewart were in the manti (also known as “Turkish ravioli”) business, her place would look just like Gülbi’s – meticulously decorated in pastels, white and floral prints. Everything matched, even the two neatly dressed women who welcomed us, Gülben (the Gülbi in question) and her sister, Leyla. But kept just behind tidy appearances, we discovered, is the pain of being Tatar. We’re convinced that this identity, which was forged in the fire of dispersal and diaspora, made the food taste better. Gülbi’s family was forced into exile in the mid 19th century at the time of the Crimean War, when Russia was engaged in a struggle with the Ottoman Empire. Tatars were thought to be Ottoman sympathizers, so being one in the Crimea was dangerous indeed. Fearing for their lives, they settled in Dubroja, then part of the Ottoman Empire and now part of Romania, where a Tatar diaspora was already set up. There, the Tatar language, a cousin of modern Turkish, and culture incubated in the tight folds of a community positioned on major 20th-century fault lines. They survived the fall of the Ottoman Empire, the creation of Romania, famine, Communism, Fascist purges and the Second World War. Meanwhile, back in the Crimea, the remaining Tatars were exiled by Stalin to Uzbekistan with devastating consequences. But Gülben and her family remained in Dubroja until 1970, when, exhausted by Ceausescu’s police state, they made their final move to Istanbul, a city, according to Gülben, that her great-grandfather had been aiming for when he was waylaid in Romania. A pastoral nomadic life might be the idealized side of the Tatar identity, but to be a refugee is a reality all Tatars know well, Gülben explained. Then she offered us a menu. We ordered one of everything.